Very Very Vicky: It's That Time of Year! Graduation season is upon us! It never ceases to amaze how quickly the years fly by and the babies of yesterday become the young adults of today. My daughter-in-law Lisa's niece graduated this year and we were pleased to be invited to a party in her honor. Now let me tell you--Lisa and her Mom Sandy, sisters Tina and Amy, and all the aunts are entertainers par excellence! Creative Tina was the party planner for this occasion. Just look at her fabulous ideas! The drink station featured lemonade and bottled water with ice nearby to fill glasses. It was such a great idea to place the drink dispenser on an upside-down mini aluminum tub--it looked good and it raised things up so it was easier to serve yourself. Notice how the bottles of water are stacked on their sides inside the white tub? It looked so nice and made it easy to put lots of bottles on the table without it looking crowded. I'm tucking that idea away to use for myself one day. The candy station was a big hit with everyone, especially the young ones. 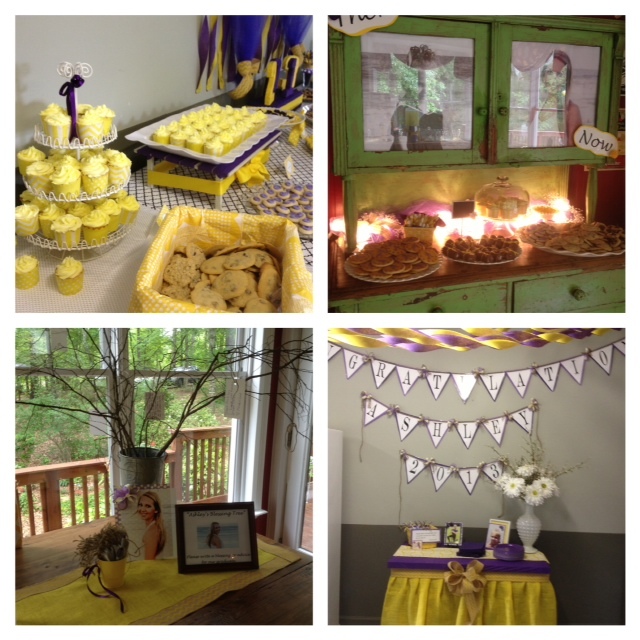 The treats were all in purple and gold, a nod to Ashley's school colors. (Top left) All the tables were laden with goodies lovingly made by family and friends. (Top right) One of the cookie stations was backlit with white Christmas lights and photos of Ashley when she was a baby and now. (Bottom left) There was a bucket of branches on one table that were designed to be a blessing tree--everyone was encouraged to write a note to Ashley and hang it on the tree. (Bottom right) Bookmarks were made and given as gifts to the guests with the request that they serve as a reminder to pray for Ashley as she moves along in her life. It truly was a wonderful party...Here's the party planner Tina with one of the youngest guests, her grandson Elan. Love the bottled water idea....I'm tucking that one away my ownself! !